These tiny toads have several unique features, including vertically aligned eyes and special hind legs for burrowing underground. A tiny Spadefoot Toad sitting upon a small leaf that dwarfs it. The spadefoot toads of North America possess the usual array of toad-like features, including a round and stocky body, with protruding eyes and short feet. Their name is derived from the hard, keratinous protrusions in their hind feet, which allows them to efficiently dig backwards into the soil. These protrusions are thus called 'spades' due to their functional similarities to the digging tool of the same name. The vertically oriented pupils of the toad's eyes are one of the most distinctive features of this species. The size of these amphibians ranges between 2 and 3 inches, and they posses a smooth skin with a grey or brown color. The hatchlings are grey colored, with distinct triangular heads. The tadpoles of this species can grow up to 2.8 inches (7 centimeters) in length, and posses a greyish color, with conspicuous golden flecks throughout the lengths of their bodies. Spadefoot toads are an interesting object of research because of their unique dietary patterns. Tadpoles and adults have their own separate food habits. Adult toads usually depend on a carnivorous diet, based primarily on invertebrate species including grasshoppers, beetles, earthworms, snails, flies, moths, and caterpillars. The tadpoles will change their diet source according to the existing environmental conditions. When very young, they will feed on microscopic plant matter (phytoplankton) as well as small aquatic crustaceans and insects. As they grow, their diet gradually transforms to a more carnivorous one. The most unique feature of the tadpole diet is intra-specific cannibalism, wherein they eat one another. Scientific experiments have revealed that environmental stresses could be responsible for this behavior of the tadpoles. American spadefoots live in shallow waters which often dry up fast, leading to the overcrowding of tadpoles and the depletion of their food sources. Often, under such conditions of stress, the tadpoles resort to eating each other to survive. During such periods, the tadpoles ‘morph’ or change form and shape, developing sharper beaks, stronger jaw muscles, and larger heads. This adaptive behavior adjusts the tadpole's body to consume higher calories and develop more rapidly in a race against their aquatic habitats drying up. The spadefoot toads of North America inhabit the continent's vast, dry areas, spanning from southern Canada to southern Mexico. The Eastern Spadefoot thrives east of the Mississippi River throughout southern Florida and northward to New England. 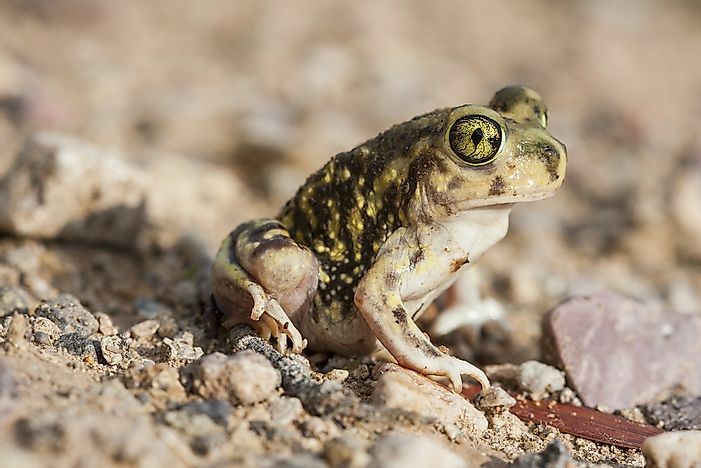 The Plains Spadefoot covers a wide territory range, from western Canada into the northwestern US, and further down south to Texas and northern Mexico, and shares a part of its habitat with the Great Basin spadefoot. The Western Spadefoot occurs in California and further south, covering parts of northern Mexico. Their habitat includes deciduous woodlands, deserts, grasslands and scrubby areas. These are the areas where waterbodies exist for transient periods, sometimes for just a few days or weeks, primarily during the rainy season. The spadefoots originally occupied habitats in South America but, with changing climatic conditions, spread northwards towards North America. The primary predators of adult spadefoots include snakes, coyotes, and owls. Tadpoles are devoured by American crows and snakes, as well as a number of other species. Spadefoot toads are able to survive the hot, dry climate of their North American habitats by spending most of their time underground. They are most active during rainy weather conditions. They spend weeks in their underground tunnels or burrows, and emerge upon the ground surface only when conditions are favorable. The depth of these burrows varies from 13.8 to 17.7 inches (35 to 45 centimeters) under standard weather conditions, to as deep as 3.3 feet (1 meter) for winter hibernation. During the dry months, they secrete a gel-like substance to prevent the drying of their skin. The tadpoles of this species are also designed to survive such harsh climatic conditions, and have an extremely fast growth rate. They will completely metamorphose into adults within just a couple of weeks. The tadpoles inhabit shallow seasonal and ephemeral water pools, ponds, and ditches, which are often dug in farming lands for providing water supply to irrigated crops. The spadefoot toads breed during the rainy seasons when they appear on ground at night in large numbers, and travel to the breeding grounds in bodies of water for mating. They prefer to choose water pools with gently flowing waters to ensure the eggs are not carried away by water currents. Males attract females by producing loud calls, and will also compete with one another to grab the attention of desired females. These mating events are usually a single night phenomenon, but repeated matings can occur within a single breeding season. The male fertilizes the eggs laid by the female underwater. The hatchlings emerge surprisingly fast, typically within a single week following fertilization. The tadpoles quickly develop to adults within the wet season. In the wild, spadefoot males usually survive for 11 years, with females typically living for around 13 years.